Embedding tweets directly into your content or your website is not a tricky task anymore. 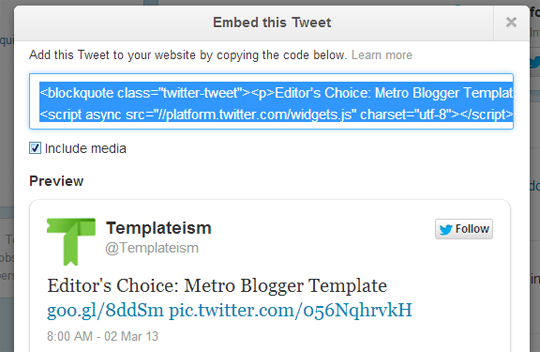 Embedded tweets make it possible for you to select any tweet and embed it directly into the articles of your website. Tweets are displays with media like Photos, article summaries and video, on the top of that it also includes real-time retweet and favorite counts. The minute embedded, tweets become interactive they allow your readers to follow the author, reply to the tweet directly from your website. 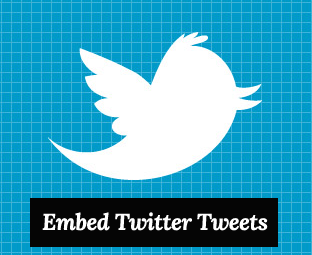 Therefore, Today in this article, we will show you how to Embed Twitter Tweets in Blogger? Every tweet made on twitter.com has a set of options known as “Tweetdeck” at the bottom, including reply, favorite, retweet and more. In order to embed, select “More” from the set of options and select “Embed Tweets”. Now a dialog will pop out which would provide you a small chunk of HTML coding. Copy and paste it directly into your articles where you would like the tweet to appear. There’s a preview just beneath the HTML coding which shows you how the tweet would appear. We have attached a screenshot below for your further assistance. After copying the code go to Blogger.com >> Create a new Post >> Select HTML Tab and paste the code where you would like to see the tweet to appear. Now publish your article, and that’s it. See the following screenshot. Change Width and Height of Tweets? By default, tweets are displayed in the same fashion the way they are displayed on the Twitter permalink page. However, they are few tweaks/settings you can change to ensure it fits your needs. At default, tweets are rendered with 500px of width. You would probably desire to override the default StyleSheet by adding a width attribution to the embed code. As seen below. Perhaps, it is the most authentic way of embedding tweets in the articles of your content. It helps your visitors to identify whether the information you are providing is trustworthy or not. By attaching a Tweet from a reliable source like @mybloggerlab people would accept the statement blindly. Good post MyBloggerLab i like it, also you can embed youtube videos on blogger comments. keep it up. Thanks! Have done this on my Wordpress blog awhile back and see it is similar (and easy) on blogger. Adding to my morning post, thanks!